Dr. Arthur Ide is the owner of Dermatology, P.A. in Minneapolis, Minn. He is board certified by the American Board of Dermatology and is an Adjunct Associate Professor of Dermatology at the University of Minnesota. He currently has four children and lives in Minneapolis. More men than women are diagnosed with AND die from skin cancer. As dermatologists, we ask ourselves why. Is this a societal issue or does it have to do with biology? What is going on here? It’s a little bit of everything, to be honest. Men are the underdogs when it comes to health and wellness. Our best approach is to look at five key issues behind this statistic and find solutions. In general, men and women have different relationships with the sun. Many women seek out UV rays in an aesthetic way. Roughly 8,000,000 women tan indoors when they’re younger compared to 2,000,000 men. Men are more likely to contract skin cancer following a lifetime of sun exposure while engaging in outdoor activities like swimming, fishing or golfing. SOLUTION: Teach men young and old to care for their skin. If your internal response to that suggestion was “yeah, but how,” I get it. Teaching men to adopt healthy skin habits can be tough. We almost always recommend skin protective clothing instead of sunscreens or lotions. Arm them with the tools that will protect them even if they forget to protect themselves. 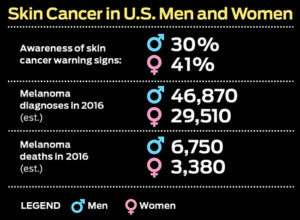 In part because of the difference in sun habits between men and women, skin cancer diagnoses are more common for women under the age of 49, and for men over the age of 49. Because skin cancer manifests itself at a younger age in women, they will often catch it before it spreads beyond one or two basal cells. 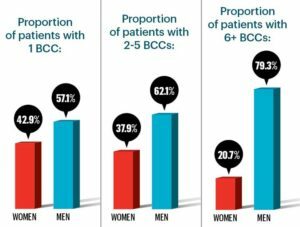 Men who are diagnosed later in life will often have accrued multiple basal cells. SOLUTION: Don’t let men wait! Getting your skin checked by a dermatologist should become part of everyone’s routine. Parents need to teach young people to care for their bodies inside and out. Adolescents learning to check their skin today stand a much better chance of detecting skin cancer when it counts. Generally, women are champions when it comes to early detection. When they notice a change in their body, they take care of it. Often when a man comes to see me they’ve been ignoring the warning signs so long they’re a bit of a train wreck. We’ll find multiple cancers. The famous line we get from men is, “It didn’t bother me”, which is often followed by, “my wife made me come”. Well sure. Skin cancer doesn’t bother you until it’s killing you. This is a key reason why men’s mortality rates are higher than women. SOLUTION: We need more watchdogs and evangelists. One of the troubles with detecting skin cancer in men is that it’s more common on their backs. Everyone needs to enlist the help of family doctors, partners and family to detect abnormalities in men. When a woman comes to our office and discovers she’s at risk or has basal cells, she’ll act. Men are more resistant to change. I had one patient who discovered he had four basal cells on his back on his first visit. Despite this, I still can’t get him to wear even a standard cotton shirt outside 100% of the time. SOLUTION: I’ve found that with men it’s helpful to show, not tell them what they need. Seeing is believing. The easiest solution is to arm them with clothing that will protect them even when they forget to. Our biggest hurdle with men AND women is to shift their dependence on sunscreen to sun protective clothing. What a lot of people don’t understand is that they need a protective shield that never fades or wears away. At the very minimum, we do our best to get women to cover their head, neck and shoulders and to get men to ALWAYS have a hat on while outdoors. The upper extremities are beacons for sunlight. Sunscreen alone will NOT protect them from harmful UV rays. They must cover up. Information about skin cancer prevention and detection often falls under the heading of “beauty” or “wellness”. These aren’t categories frequently sought out by men. If I could get a sports reporter to highlight sun protection use in the stands at every game, we’d be in much better shape. We need to get better at spreading the message to everyone that needs it. SOLUTION: Support organizations like the Melanoma Research Foundation and The Skin Cancer Foundation. Their key purpose is to educate EVERYONE about the importance of skin cancer prevention and detection. Even smaller, local organizations make a big difference in terms of educating men and women about the threat of skin cancer and how to prevent it. 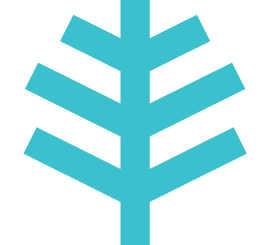 Dr. Kathryn Dempsey is a board-certified dermatologist who practices in Mobile, Alabama and spends her weekends at Orange Beach. She enjoys teaching about the importance of daily sun protection. Here she has provided some tips on the sneaky ways ultraviolet rays reach us to ensure you stay educated and protected! 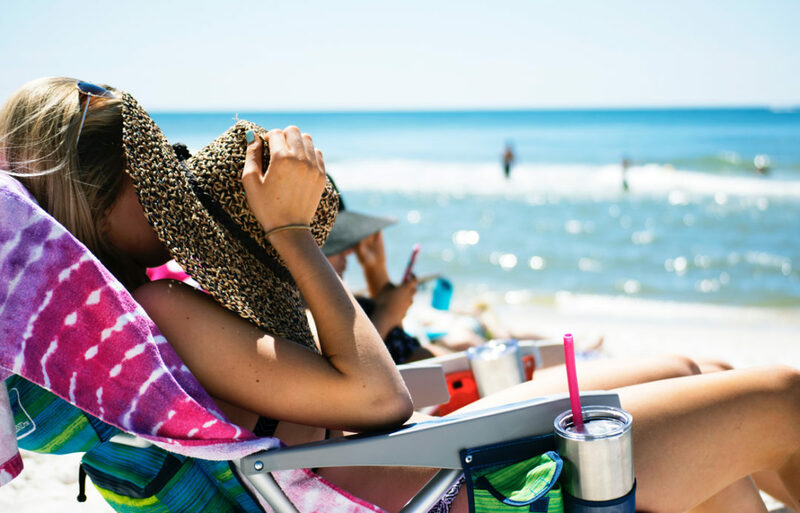 Each visit, I ask each of my patients, “How are you doing with your sun protection?” and nine out of ten times I get the same answer: “I don’t go in the sun.” I always take this opportunity for education on the ways ultraviolet rays reach us outside of just tanning on the beach. Most people don’t realize that the majority of our sun exposure happens on a day to day basis, often when we least expect it. Here are five ways UV radiation reaches us, even when most people think they are safe. In the Car. Every time you drive you are exposing yourself to UVA radiation. While the law requires most front windshields to block the majority of UVA and UVB, side and rear windows do not have this same requirement and UVA comes straight through. So during that short (or long) commute to work, you are getting direct UVA exposure, mainly to your left side. UVA contributes to both premature aging and skin cancer. We know that more skin cancers occur on the left than the right and this is because of driving. At Work. 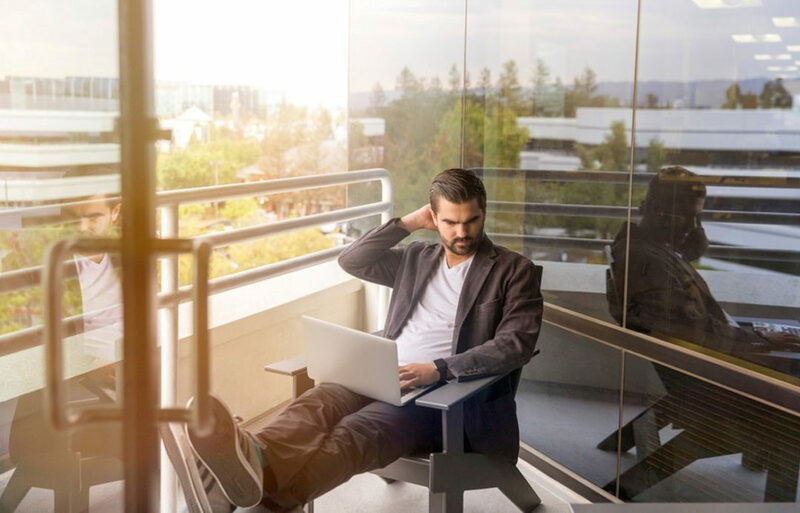 Many people are lucky enough to have a workspace with windows and if you are working within several feet of one, UVA is reaching you. Remember, UVA penetrates through glass and windows. In Shade. We get it when we think we are protected by shade. It reflects off of sand, water, pavement, grass and snow. Studies have shown that sunscreen and protective clothing in addition to seeking shade is significantly more beneficial than seeking shade alone. At a Nail Salon. That’s right! We get it when we have our nails done. Did you know that the lights they use to speed polish drying emit UVA? And UVA Is also what is used to set gel manicures. Protect your hands! During Rainy Days. This may be the sneakiest way it reaches us and I always see a surge of sunburns after overcast summer days. While clouds may block sunlight, they do not block ultraviolet radiation and some of them even magnify it. Scary! Did you know that one year of 2 minutes of casual sun daily adds up to 2 weeks of a beach vacation’s worth? And now that you know the sneaky ways that UV rays are reaching you, think about how much you really get – far more than 2 minutes a day. Therefore, it is so important to protect yourself on a day to day basis and this starts with sun protective clothing. I always recommend clothing with UPF 50+, a wide-brimmed hat and a broad-spectrum SPF of at least 30. If we all did this on a daily basis, I assure you there would be a lot less skin cancer in this world! Dr. Jennifer T. Trent is a world-recognized dermatologist, who has published over 40 articles in peer-reviewed journals and 6 chapters in various dermatologic textbooks on surgery and wound care. She is currently Medical Director of American Dermatology Associates Inc and voluntary Assistant Professor of Dermatology at the University of Miami. With summer here. It’s time to stock up on all your sun protection essentials. Follow these tips and you will be able to enjoy the outdoors without getting a sunburn, which can ruin your summer and your skin. Sunburns are a reddening and blistering of the skin from overexposure to the deadly ultraviolet (UV) radiation of the sun. Sunburns and cumulative sun exposure lead to the development of skin cancers. 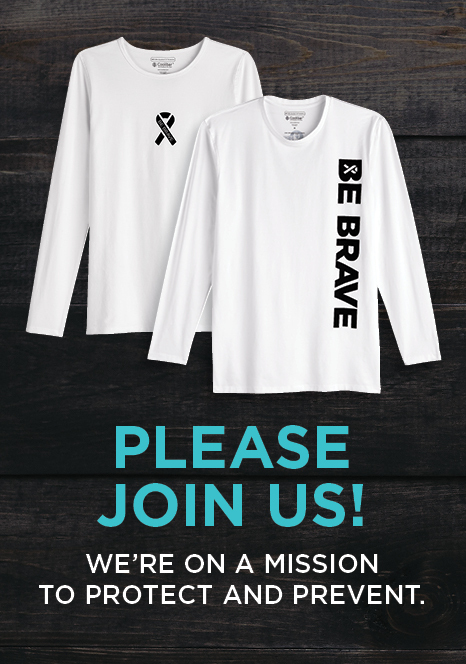 Every year, over 5 million Americans will be diagnosed with non-melanoma skin cancers (NMSC) and over 200,00 Americans will be diagnosed with melanoma (MM). One dies every hour in the United States from MM. These stats are scary but also very preventable! If you follow these ABCD’s of sun protection, so you can stay safe and still enjoy the outdoors! A = Avoid the sun, especially between the hours of 10am-4pm. The sun’s harmful radiation is at its peak during those times. Seek shade or the indoors to stay safe. B = Block the sun’s radiation by using sunscreen. Here are certain tips which will help you with sunscreens. Not every sunscreen is created equal. Some sunscreens say they have SPF 50 coverage, but they actually may not! I always consult with the Consumer Report’s guide to the best sunscreens. It is a great annual report on sunscreens they have tested and if they live up to their marketing. I recommend one with SPF 50+ broad spectrum UVA and UVB protection. If you are using one with chemical blockers you need to apply it 30 minutes prior to sun exposure. If you are using physical blockers, you can apply it immediately prior to sun exposure. Also, make sure you apply enough of the sunscreen. It takes 1 ounce to cover the entire body and a nickel size amount to cover just the face. Always check expiration dates on your sunscreen. If it doesn’t have one, I would discard it after 6 months. You must reapply sunscreen every 80 minutes. If you are swimming or sweating a lot, you might need to reapply every 40 minutes. The directions on the back of the bottle of sunscreen should tell you how often you need to reapply. NO sunscreen lasts all day! C = Cover up. Sunscreen is very important, but cannot by itself protect as well as the combination of sunscreen with protective clothing. It is important to wear a wide brim hat with UPF 50+ and at least a 4-inch brim. I adore Coolibar’s Shapeable Poolside Hat which has a 7-inch brim! I never go the pool, beach or boat without it! It helps protect my face, scalp and neck. Another essential is a Neck Gaiter, which I can pull up over my cheeks and nose for the extra protection I need from the reflected sun while boating. My Costa sunglasses are a must for outdoor activities of any kind. They serve to not only protect my eyes but also the skin around my eyes. When I am outside, I always wear long sleeves and long pants. If I am at the pool or beach, I always wear my Cabana Hoodie with beach pants. They are lightweight and very protective. When I go swimming or boating, I use my Coolibar swim tights and long sleeve rash guard. They fit snuggly so it doesn’t interfere with my ability to swim. If I am working outside in the yard or attending a polo match, I love my leggings with a long sleeve tunic. They are lightweight, stylish and protective. I never leave home without my Coolibar gloves. They are great for boating and for manicures that use UV to cure the gel polish. Hands are a dead giveaway for your age. So, don’t forget to protect them. D = Dermatologist. Make sure you see your dermatologist at least every year to check your skin for cancer. Early detection and treatment is the key to surviving skin cancer. Prevention is the best, but sometimes we forget to be as conscientious about sun protection as we need to be. We are only human. If you do get a sunburn, just remember to reassess your sun protection habits so it does not happen again. Stay safe out there this summer! 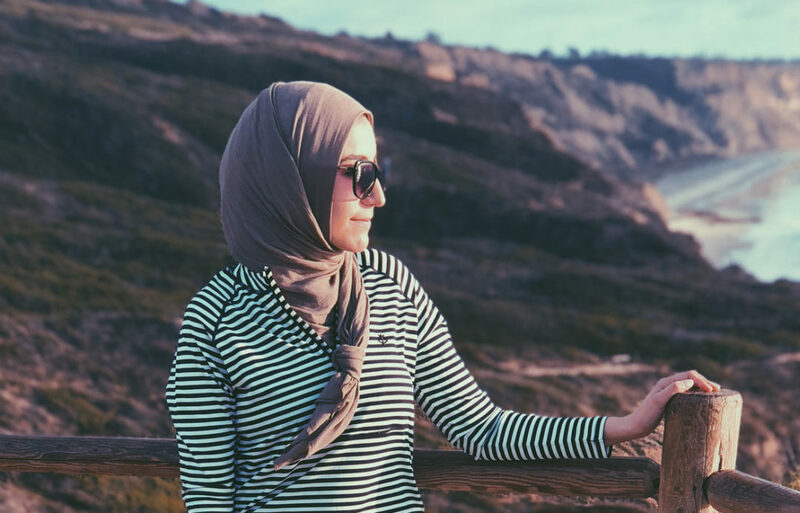 As a Muslim-American female, I am no stranger to being covered in the sun. In accordance with my faith, I wear the hijab. Wearing the hijab does not only involve covering my hair. I also cover my skin—except for my hands, feet and face. As an all-American girl, I was born and raised on American fashion trends. I have always seen the fabric I wrap around my head as just another accessory piece to complete my outfit of the day. My struggle truly began with Michigan summers on the lake. In accordance with my faith, I couldn’t wear a revealing bathing suit into the water. I shied away from participating in water activities because I often felt embarrassed to jump in—fully covered. Flash-forward to just a few years ago, when my husband and I were planning a vacation to escape the stresses of my medical school training. I was yearning for some warmth and sunshine but felt anxious about finding modest swimwear that wouldn’t make me a spectacle to strangers on the beach. My online search led me to Coolibar. Finally, I discovered fashionable, modest clothing with the primary purpose of UV sun protection in both fabric and design. Following graduation from medical school, I began my residency training in dermatology and became extremely passionate about sun protection. To this day, the first skin cancer excisional surgery I performed is very fresh in my memory. The surge of excitement from my role in the treatment was shadowed by the heavy burden of making sure I correctly conveyed the importance of sun protection to prevent future skin cancers. As a dermatology resident, I’ve come across patients of all ages, ethnicities and walks of life who have skin cancer. Regardless of their background, every single patient is regretful about their time spent unprotected in the sun. Through personal and medical reasons, I’ve taken Coolibar to heart. Not only because styles offer more skin coverage for sun safety, but their UPF 50+ sun protection is guaranteed for life. I never have to worry about my patients or myself when it comes to exposure to harmful UV rays. 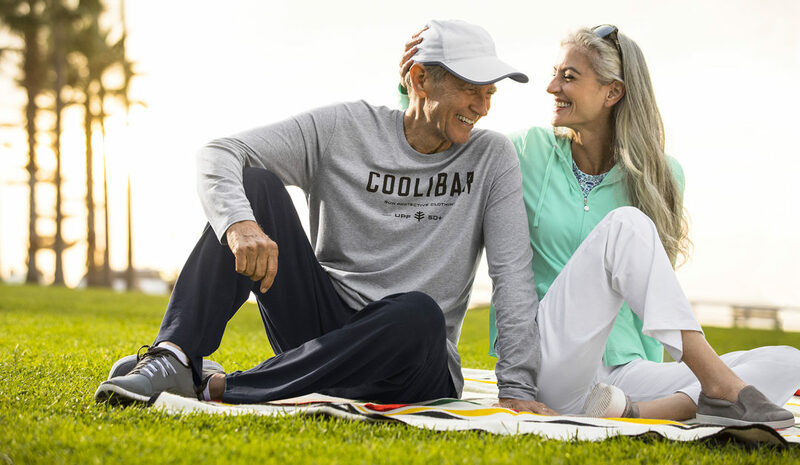 I love my Coolibar gear because it provides me modest, stylish and, most importantly, SAFE clothing to wear while outdoors!